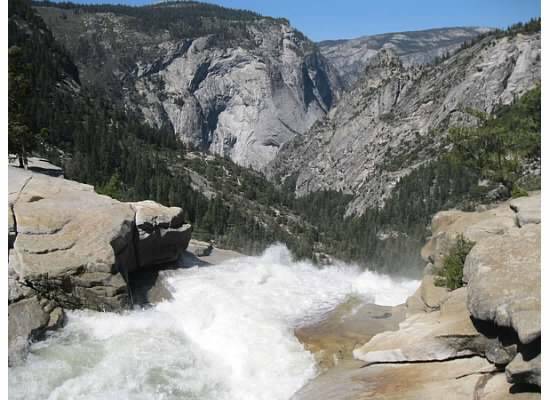 Nineteen years plus one day ago I was on the trail to Vernal Fall during my first visit to Yosemite National Park. Fast forward almost to the day and I was back on the same trail. 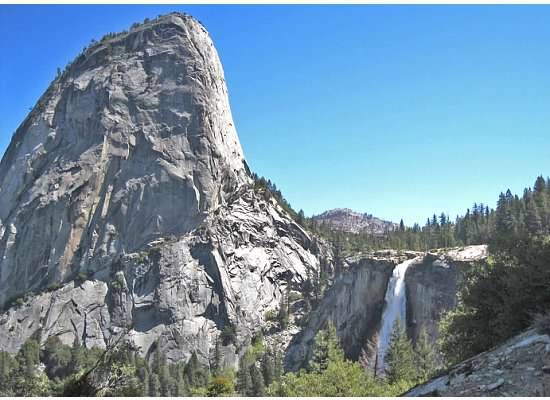 Much has changed in Yosemite since then, but one thing has not: to get to the falls from the valley, all trails head uphill. 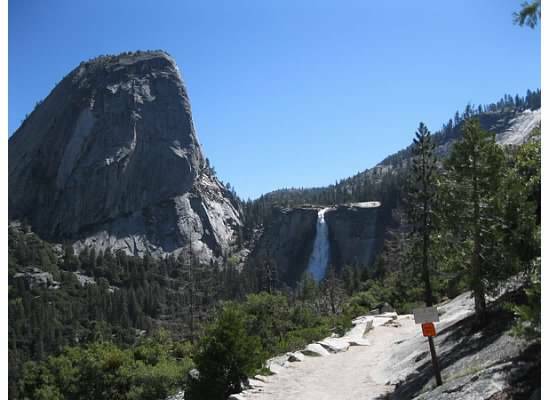 Two walkers head up the wide path to the Vernal Fall footbridge. 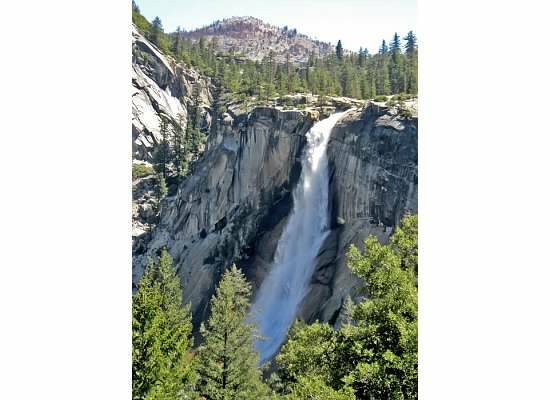 My destination on this outing was Nevada Fall. 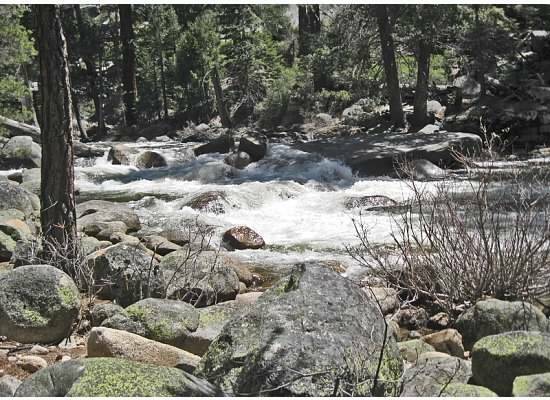 Instead of walking up the Mist Trail (which Andrew and I did in November 2013) I ventured up the longer John Muir Trail. 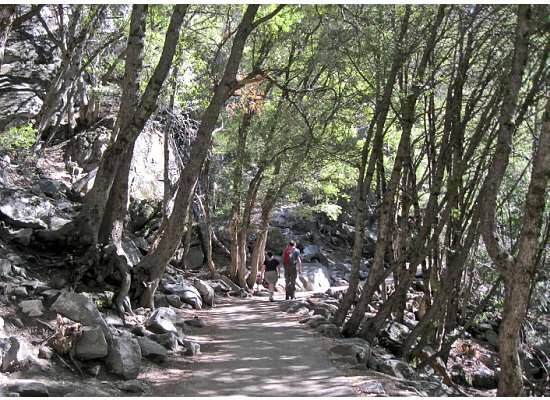 Hiking this section of the JMT meant not seeing Vernal Fall, instead walking in the shade under a canopy of fragrant trees. 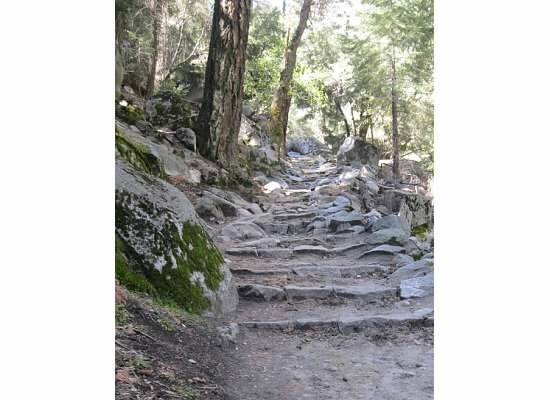 There were many sets of steps to climb but none as steep as those on the Mist Trail. It was a slow, heart-pounding grind up two thousand feet, but I kept a steady pace and counted the series of switchbacks that led to Clark Point, seventeen in all. Though longer, this stretch of trail was less crowded than the more direct route. I figured I’d take a break at the point. Illilouette Fall could be seen in the distance. Upon rounding a switchback I came face-to-face with a manmade stone retaining wall. The wall hit me like a ton of bricks. It was then I realized that all my concentration was centered on getting up the hill and none of it was focused on the beauty surrounding the trail. Coming out of the woods at the point, the view opened up. There sat Half Dome, Mt. Broderick, and Liberty Cap. Now I couldn’t help but focus on the beauty around me. Half Dome, Mt. Broderick, and Liberty Cap with pointy Mt. Starr King in the distance. Nevada Fall was just a mile away and I could see it from the trail. With no time to waste, I decided to forego the break at Clark Point and continued up the hill following the JMT. First glimpse of Nevada Fall. 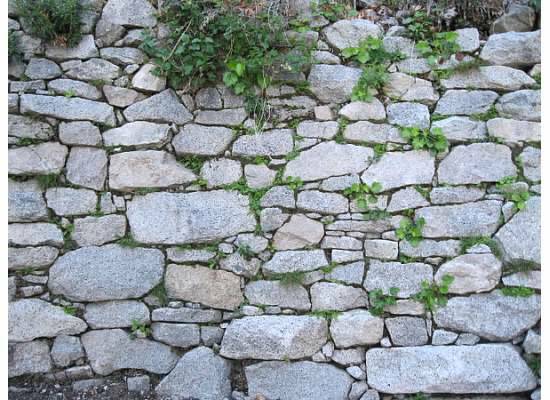 The path skirted the mountainside with a solid stone wall protecting the edge. Slushy snow from a recent storm sat melting on the trail as I approached six thousand feet. Water dripped from the top of the mountain like rain falling from the sky. To keep from getting wet, I walked close to the wall and peeked over to have a look. It was awesome. 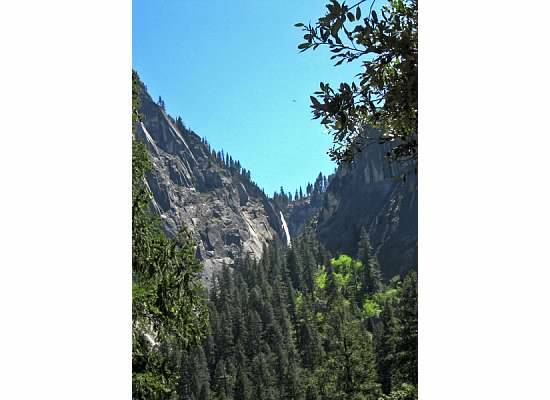 Looking over the wall at Liberty Cap and Nevada Fall. 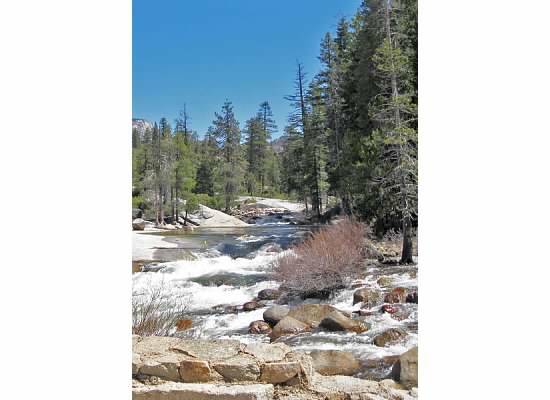 People milled about near the footbridge at the brink of Nevada Fall. Some talked with a Search and Rescue ranger who was on hand, and a few sprawled out on large boulders and soaked up the sun. Looking up river from the bridge. I crossed the bridge and continued walking alongside the surging river. Though I was hungry and needed a break, I didn’t want to stop. Walking at a slower pace, I pushed forward towards Little Yosemite Valley one mile away, a smaller valley above Yosemite Valley proper. The brink of Nevada Fall from the bridge. A 480 foot drop. Instead of going up to LYV, I found a secluded spot near the water. I drank in the beauty of the river, then closed my eyes and listened to its powerful sound. Lunch tasted exceptionally good. A squirrel begged for a tasty morsel. He slowly inched his way closer until I shoed him away without a bite. I packed up then headed out knowing that the trek downhill would be easier on the heart. Though I didn’t need a break going uphill, halfway down I sat on a rock to rest my weary knees. A hiker gives perspective to the magnitude of Mt. Broderick and Liberty Cap. 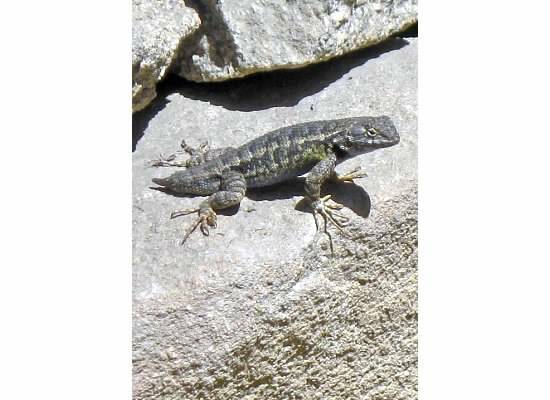 Lizards ran up and over the rocky terrain. A fresh mountain breeze blew arousing a flurry of dust and leaves across the trail. The hikers who passed me were fascinated with the lizard. Birdsong filled the air. Up in the trees one bird whistled a distinct call. A second answered. From a distance a third responded, and farther away, barely audible, a fourth echoed the call. I realized I missed a lot while walking uphill. 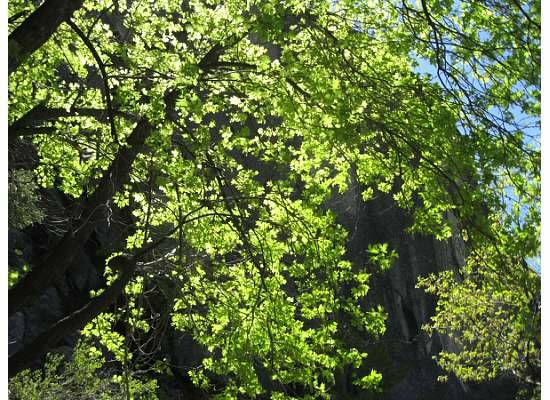 The sun shining on the leaves of this tree lit up the shady trail. On the way out of the park I stopped and said hello to my daughter Julia who earlier in the month began her seventh season as a Yosemite ranger. 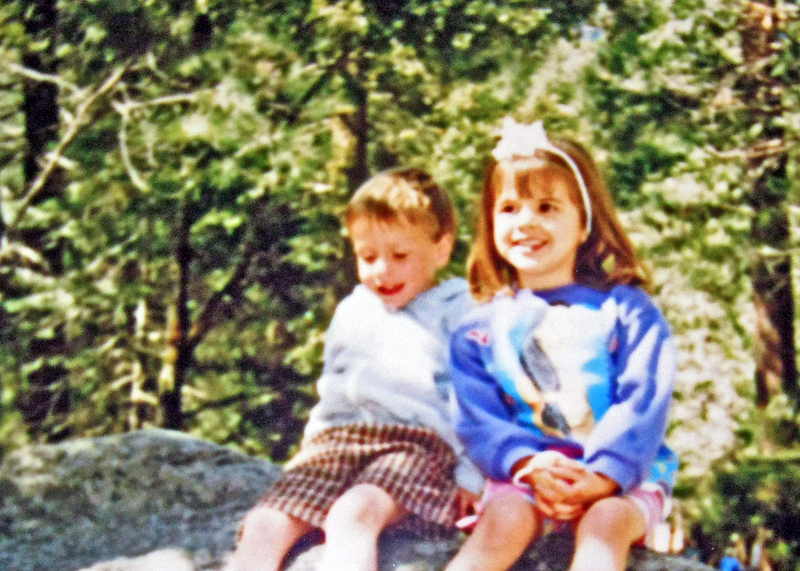 Here’s a photo of Julia and Andrew nineteen years ago during our first trip to Yosemite. It’s hard to believe so much time has passed. Andrew and Julia in Yosemite. April 1996. 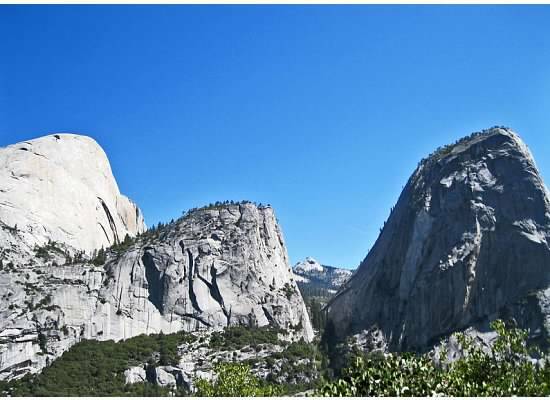 This entry was posted in Yosemite Hikes and tagged Hiking, John Muir Trail, Liberty Cap, Merced River, Nevada Fall, Yosemite, Yosemite National Park on May 12, 2015 by Janet. Well, i settled for the Like Button because there was not a LOVE IT Button! i love the scenes, the extra sights on the walk back down, and the memories of an earlier trip. Thanks for sharing! Aw, Patty, thank you. You always say the nicest things. 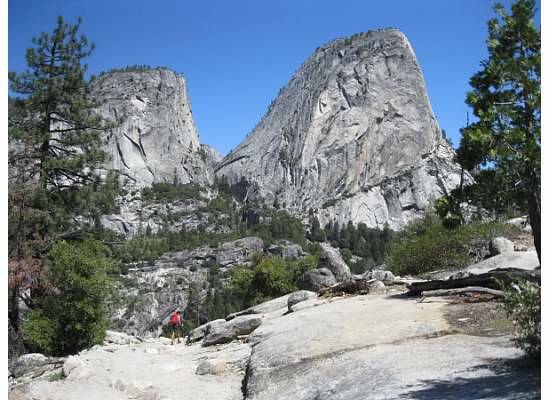 I would have added more photos from our original trip to Yosemite, but they were horribly blurry. Your love for the park is infectious. Just beautiful, what a fun day. Thank you for sharing, taking me back to nature for a brief minute. Thanks, Terri. Yosemite is a great place to be. I am the same way on the climb up, always focusing on where I put my feet. I have to constantly remind myself to stop and look around! This looks like a beautiful hike, thanks for sharing! I didn’t realize that Julie was a ranger. How wonderful! Sounds like destiny! Looks like a beautiful hike! And the waterfall is awesome!